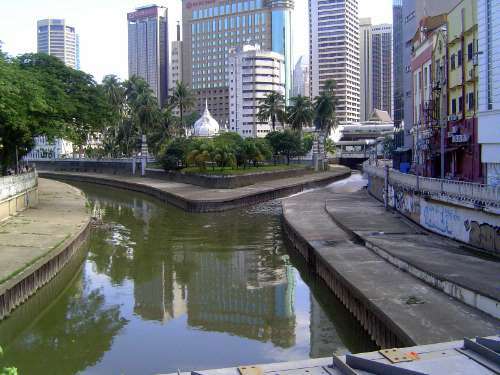 Here we stand, at Kuala Lumpur proper, the "muddy confluence" between the Gombak on the left and the Klang on the right. 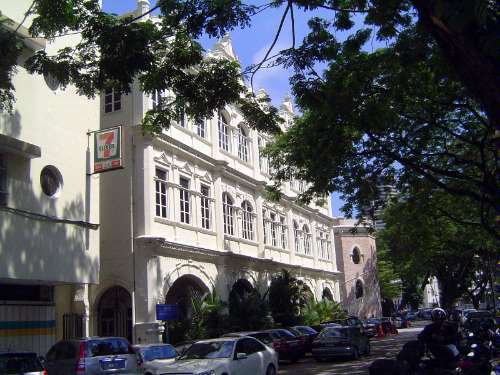 In the wedge between them a Malay cemetery stood until 1909, when the city's first mosque, the Masjid Jamek or Friday Mosque, was built to an Indian design contributed by A.B. Hubback, a government draftsman. For a time the mosque had a handsome location, with a broad, curved staircase down to water. 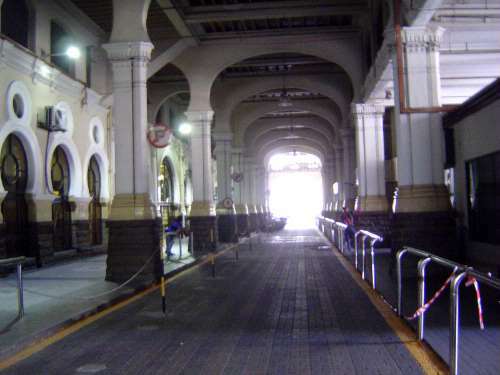 The stairs are gone, the creeks have been canalized, and entrance to the mosque is restricted to Muslims. 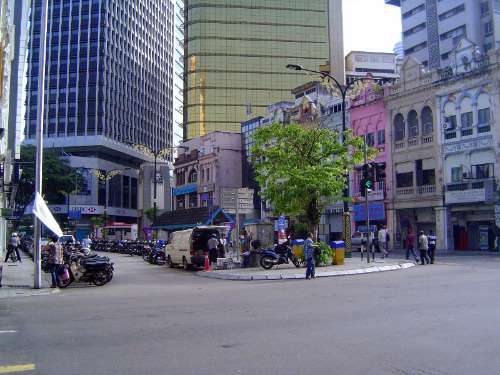 Still, the location is a historic one, and something of the city's history can be read from the juxtaposition of shophouses on the right and highrises in the distance. 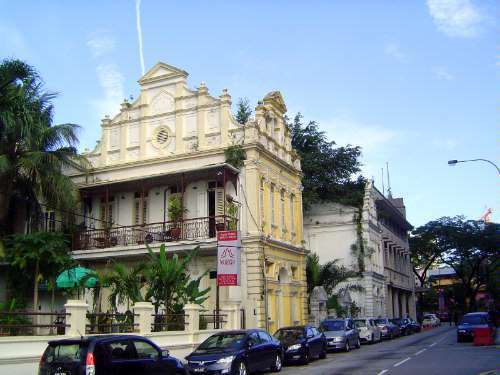 The shophouse originated in Singapore during the 1840s. The standard form included a five-foot covered walkway or kaki lima with living quarters extending overhead to the property line. 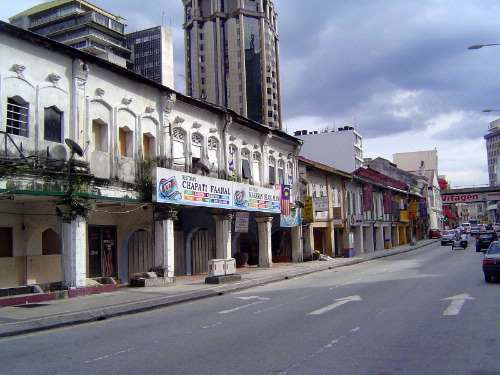 The view here is along Jalan Tun HS Lee, the former High Street. 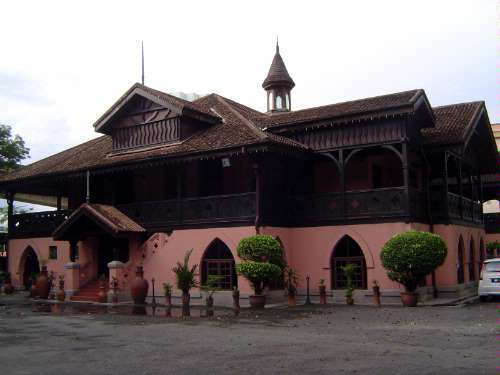 Frank Swettenham, who played as large a role in these parts as any Englishman, wrote in his journal for 1875 that "Qualla Lumpor, the depot for all the mines in Klang, is perhaps the best built village, and has the most flourishing appearance of any in the Peninsula. 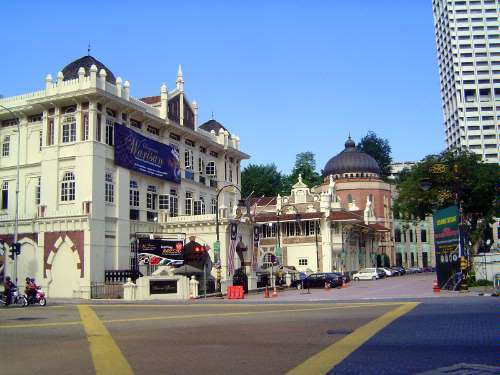 The town is well laid out, with a market and a gambling booth, and is situated on the left bank of the Klang River. There are about 1,000 Chinese and 700 Malays resident in the town, and the authorities are a Captain China and a Toh Dagang.... Almost the whole of the present town of Qualla Lumpor has been built in the last year." 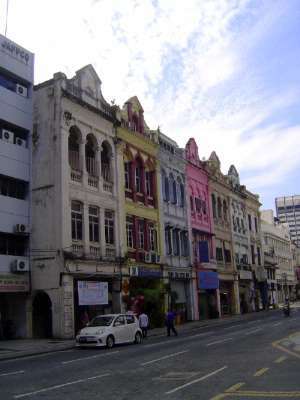 Some shophouses were not only ornamented but provided with two upper stories. 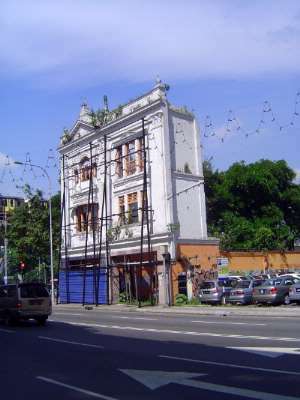 The ornament could be extravagant, as here on Jalan Tangsi, formerly Barracks Road. About as high up the economic totem pole as could be: this is the house designed by A.K. 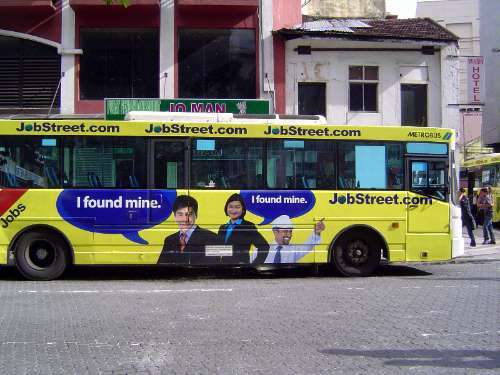 Mosdeen for Loke Chow Kit, a wealthy businessman. 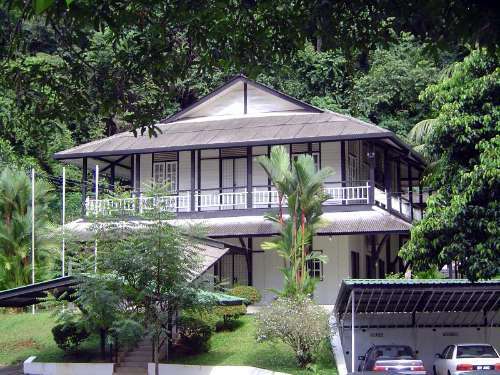 The house was completed in 1903, but Chow Kit did not like it. 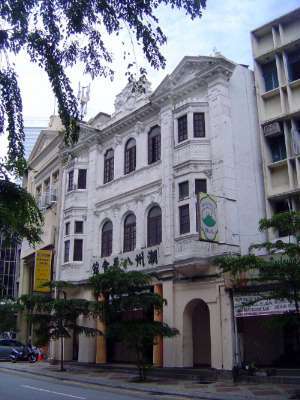 By 1908 the house had become the Empire Hotel, which it remained until 1960. (Old photos show that name inscribed under the pediment.) 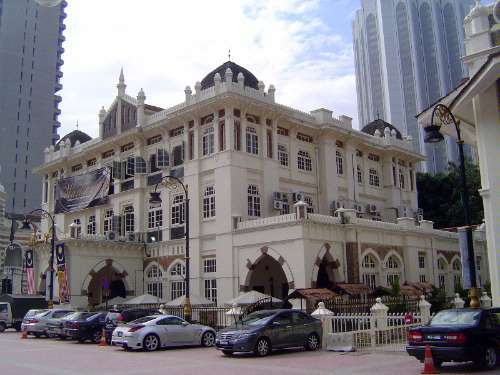 In 1960 it became the Peninsula Hotel, and in 1973 it became PAM house, the home of Persatuan Arkitek Malaysia, the Malaysia Institute of Architects. 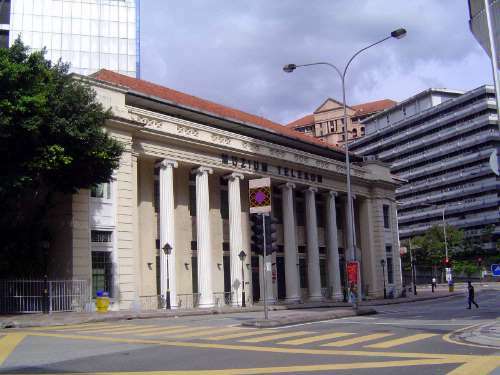 The Chinese community built this Assembly Hall in 1921 to house the Chinese Chamber of Commerce for British Malaya, now the Associated Chinese Chambers of Commerce and Industry of Malaysia. It's not the only building in town spoiled by the monorail. 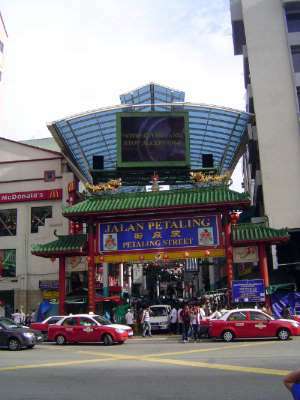 During the first half of the 19th century, control of the tin industry shifted from Malay to Chinese hands, and by 1884, 90 percent of the town's 4,000 residents were Chinese. 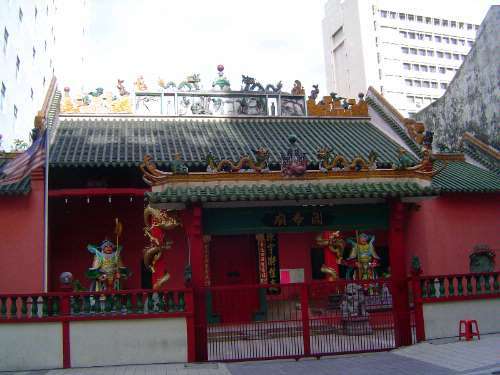 Here, the Kwang Siew Temple, from 1888. The Chan She Shu Yuen Clan Association, 1906. There was an Indian community, too, largely Tamil. 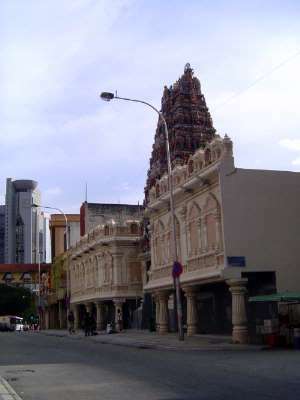 Here, the Sri Maha Mariamman Temple, 1873. Then there were the British. 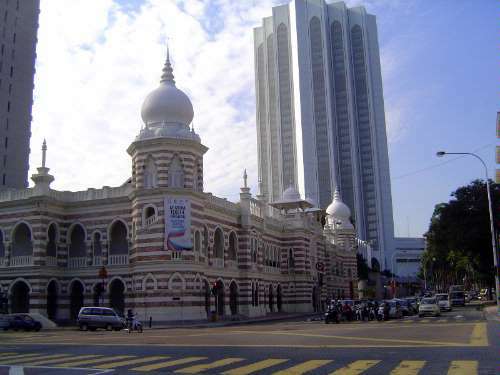 In 1880, they moved their Salangor Sultanate headquarters from the coast, at Klang, upstream 20 miles to Kuala Lumpur. 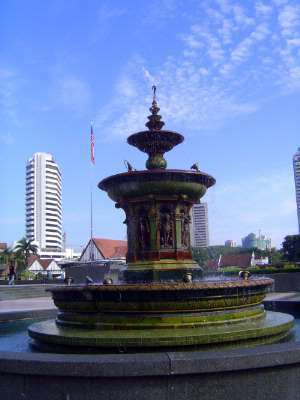 In 1896, the city also became the capital of the newly assembled Federated Malay States, covering half the Malay Peninsula. The center of British power was built here, around a bit of waste ground across the river from the growing Chinatown. 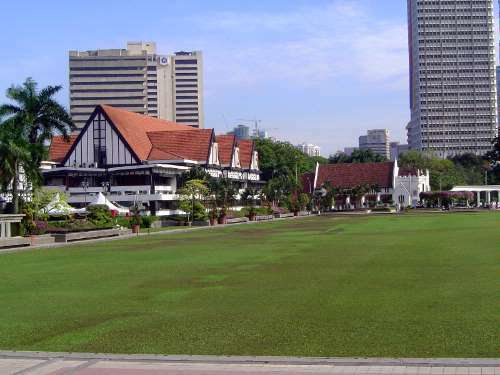 Here the British created a parade ground, later known as the Padang or Field and, later still, as Merdeka or Freedom Square. An official report from 1892 notes "the raising and turfing [of] a portion of the Parade Ground..." It states that "a cricket pitch was formed and put in good order... and the swamp at the lower end of the ground near the Chartered Bank was partially filled" (Gullick, p. 111). Offices were called for. 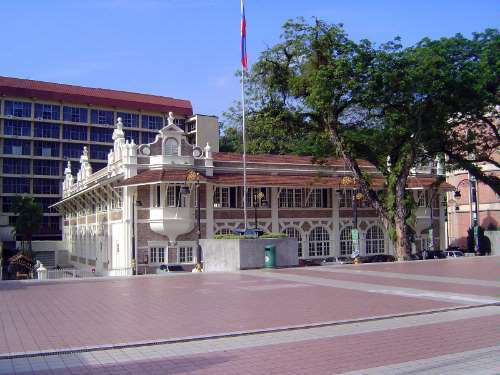 Here, on the left and fronting the parade ground, is the building called simply New Government Offices. Completed in 1897, it was built on land purchased for $30,000 from no less that Frank Swettenham, whose ownership was hidden behind nominees. 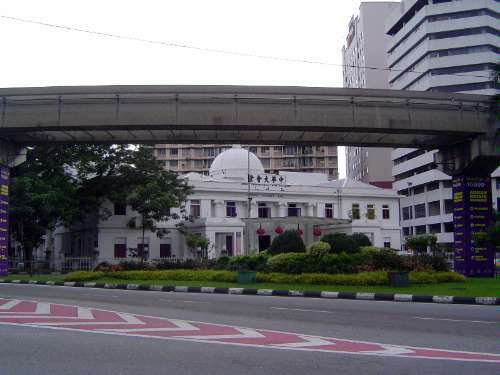 Later the building became the Federal Secretariat and later still, after independence, Bangunan ("Building") Sultan Abdul Samad, in memory of the Sultan of Selangor in 1897. Sixty thousand dollars was the building's original estimate, but then there was a switch of governors. The State Engineer, C.E. Spooner, wrote that he approached the new governor with a more ambitious project. "I stood behind the chair of the acting Governor (Mr Maxwell)... and I leave you to imagine my feelings when he did not put his pen through... a vote for $152,000." 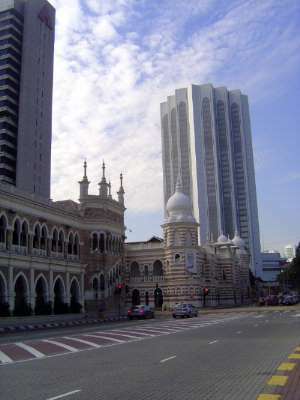 The style--a first for Kuala Lumpur--was copied from British India by Spooner's chief draftsman, R.A.J. Bidwell. Spooner called it "Mahometan," although in India it would have been called Indo-Saracenic. 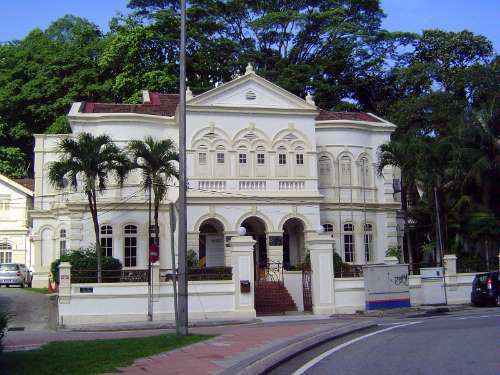 Bidwell quit midway through the project and was later responsible for the Raffles Hotel in Singapore. The work here was continued by his successor, A.B. Hubback, the same man who later designed the mosque by the river (Gullick, p. 152). For all its historic allusiveness, the tower is steel and concrete. On the left (and shown at the right side of the previous image) is the former post office, added in 1907. 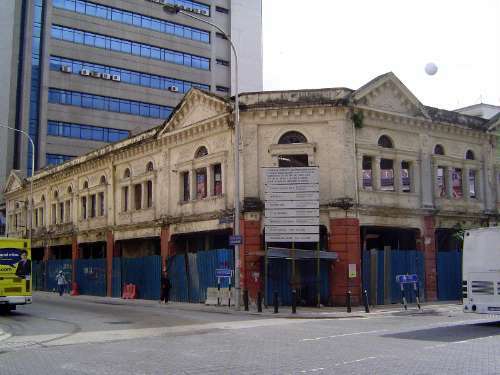 Across the street is the former headquarters of the Federated Malay States Railways; it, too, was by Hubback. Here it is a bit closer. 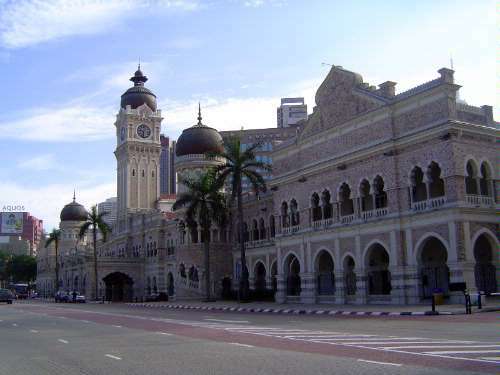 The railroad from Kuala Lumpur to the port at Klang opened in 1886 and by 1909 was part of a system stretching from Penang to Singapore (picky-picky: technically, the track ran from Butterworth to Johor Strait). 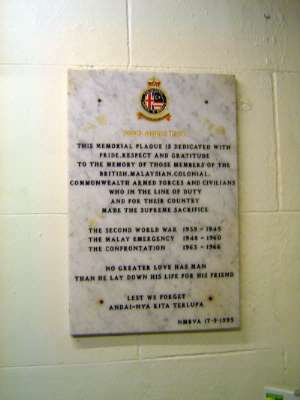 A telegraph line to the outside world, via Malacca, also opened in 1886. The railway offices were delayed until 1905 and were almost immediately obsolete. They were soon moved to a larger building. 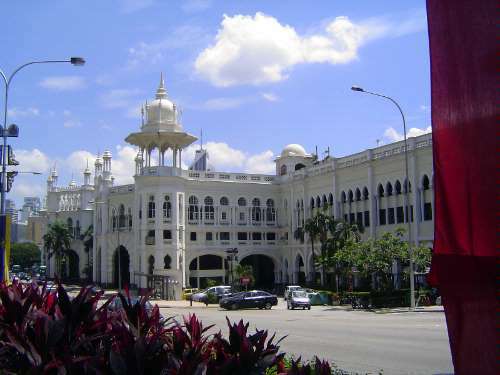 Behind what is now the excellent national textile museum is the Dayabumi Complex, government offices whose design leaves no doubt as to the primacy of Islam in Malaysia. Still on the same corner, here's the former Chartered Bank, formally the Chartered Bank of India, Australia, and China. This branch opened in 1891, though the building was remodelled in 1909. 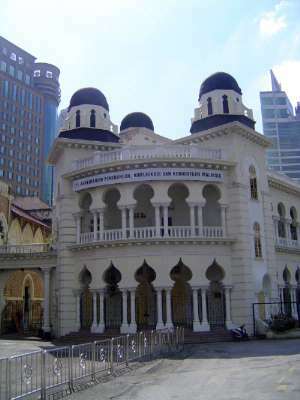 The domed building behind it was the city's public library; between the two is the former printing office, from 1899. 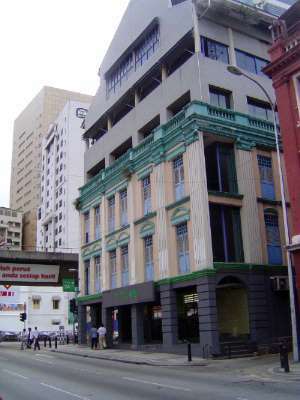 The Chartered Bank building now houses a restaurant. 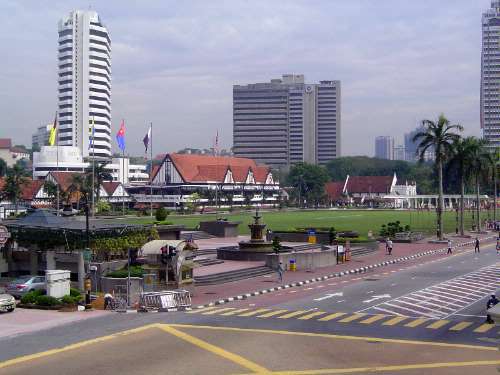 We're still on the same corner but now looking across Merdeka Square to the Royal Selangor Club. To its right is St. Mary's Cathedral. The fountain in the foreground is worth a closer look. It was imported from England as a memorial to Steve Harper, a senior police inspector. 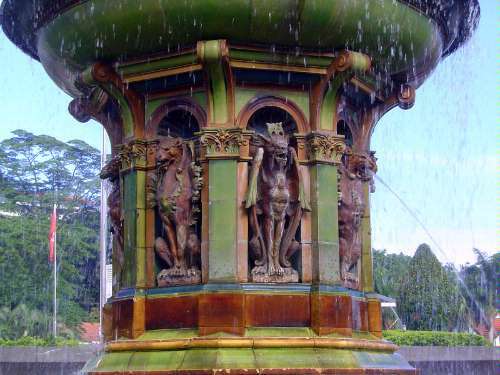 Harper is said to have been fond of animals, so the fountain was designed to allow them to drink. The Club, from 1910, replaced an earlier building. It was, Gullick writes, "not disposed to welcome Europeans of working-class origin and manners" (p. 142). 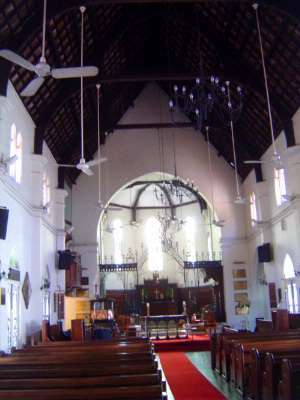 The Cathedral was the work of A.C. Norman, a government architect with the public works department. 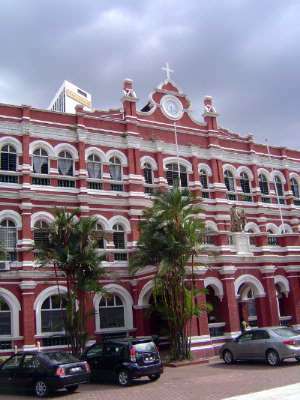 Church-affiliated English-medium schools arose, in this case St. John's Institution, a Catholic boy's school established in 1907. Across the street, a girl's high school. Much of the British housing has been levelled, but a bit remains, like this house, close to the St. John's school grounds. 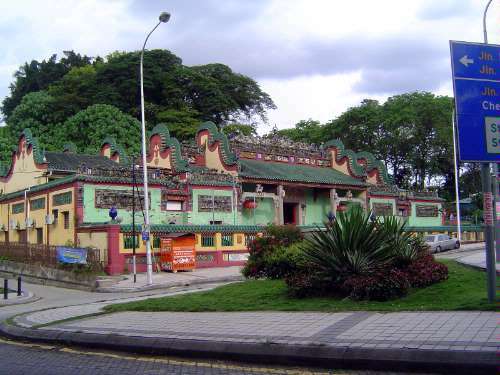 A more exotic house, now the Taman Budaya Kuala Lumpur, a government sponsored cultural center. Shopping? 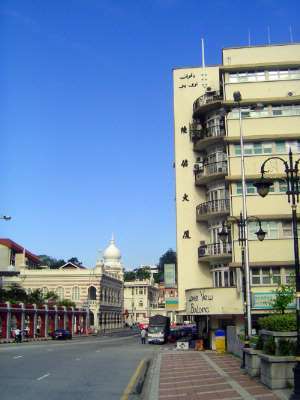 The Chow Kit Department Store opened in 1905 on the banks of the river and just downstream from the mosque. The design was by A.K. 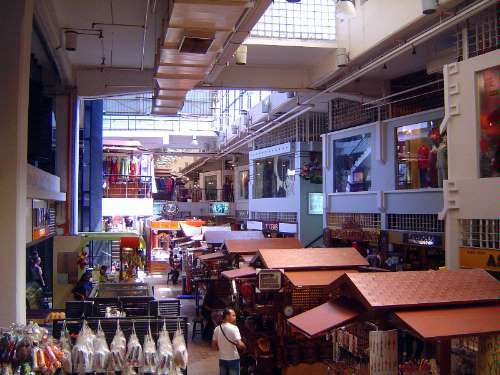 Moosden, and the client was Loke Yew, a Chinese businessman who leased the building to Chow Kit. An advertisement appearing in the Selangor Journal for 1895 listed a wide variety of imported goods for sale, including York hams, cheddar cheese, California fruits, Australian butter, Cuban cigars, and European shoes (Gullick, p. 68). 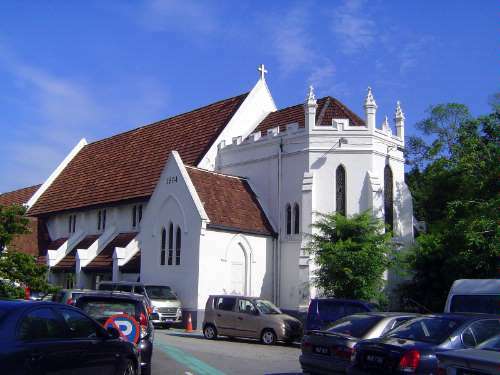 Chow Kit was from Penang, where he had attended the Penang Free School. He entered the grocery business in 1892 and eventually offered tailoring, millinery, insurance, printing, and more. 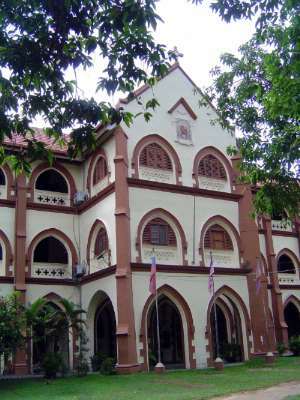 Wedged along the Gombak, this was the Supreme Court Building, added in 1915. It's now the Ministry of Information and Communication. 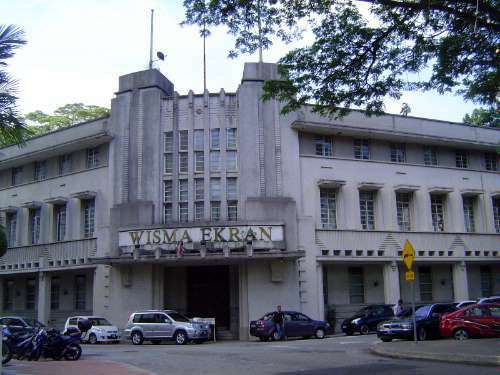 And here is the city's historic railway station or Stesen Keretapi KL, opened in 1911 and designed by the prolific Hubback. 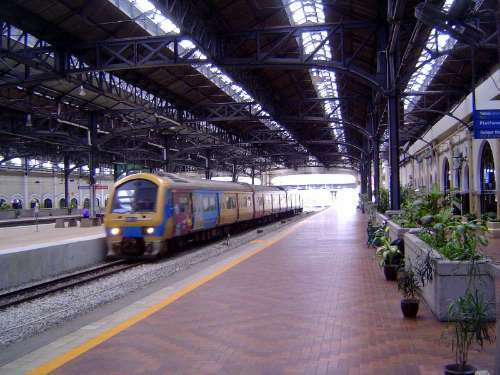 The station is a shadow of its former self, now that most trains are routed through the new KL Sentral. 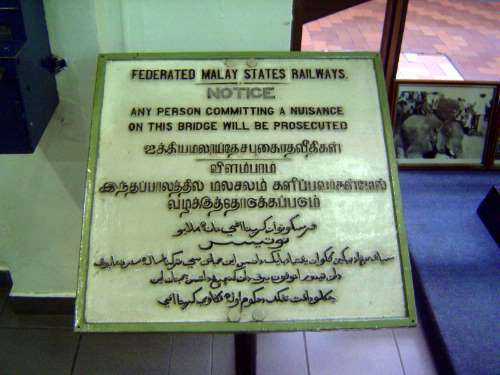 An old railroad sign in English, Tamil, and Jawi, an Arabic adaptation formerly standard for Malay. 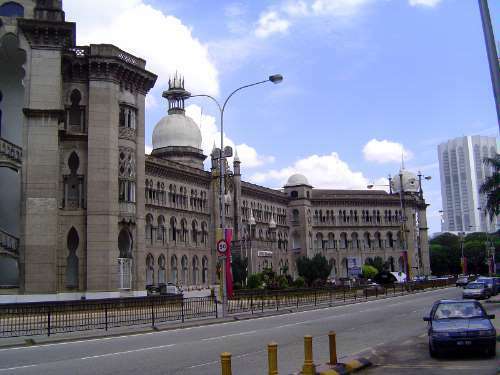 Across from the station are the second railway offices, the KTM Building (Bangunan KTM Berhad), opened in 1917 to another design by Hubback. Neoclassical design comes almost as a shock, but here it is in the telephone exchange building from 1928. By then, the city was on the verge of an Art Deco boom. 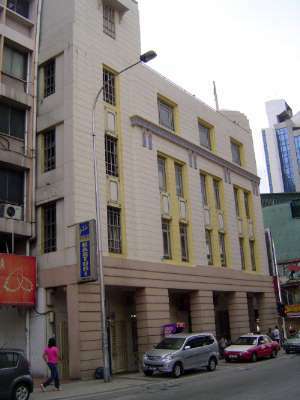 Here's one example of it, the 1937 Anglo-Oriental Building, named for the Anglo-Oriental Mining Corporation, at the time the world leader in tin mining and smelting. Through subsidiaries, it controlled a third of Malaya's production. The architect was A.O. Coltman. The current tenant is a property developer, Ekran. 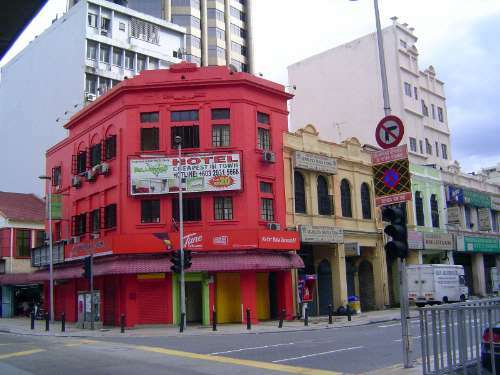 Another Coltman building, almost impossible to photograph because of monorail tracks and construction: this is the Oriental Building, originally the home of Radio Malaya. 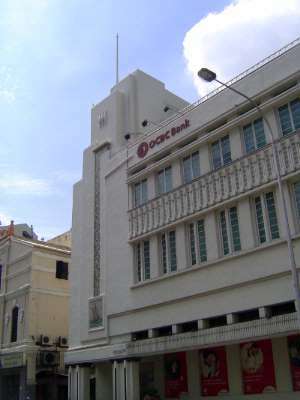 And another, the OCBC building of 1935. We're on a bridge over the Klang River; that's the old railway office building in the distance. 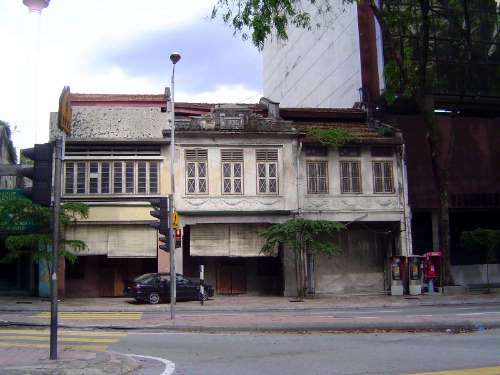 On the right, the Loke Yew Building, which adjoins the former Chow Kit department store. 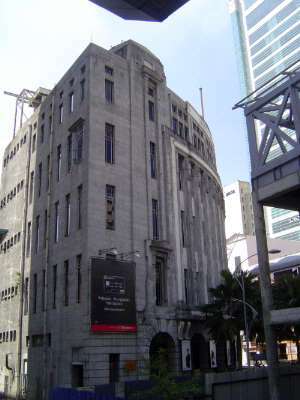 The Lee Rubber Building, named for Lee Kong Chian, "the rubber and pineapple king," who helped found the OCBC in 1933 and was its chairman for over a decade. He was also vice-chancellor of the University of Singapore. 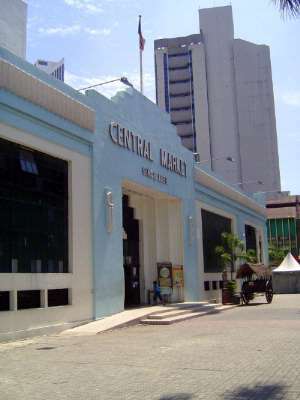 The Central Market was originally established in 1888 but was replaced with this building in 1936. Once it had vegetables and fruit fish, beef, pork, and poultry stalls. Slated for demolition, it was then designated as a heritage building and reopened in 1986 as an arts and culture center. In the years since then, the city has grown amazingly. 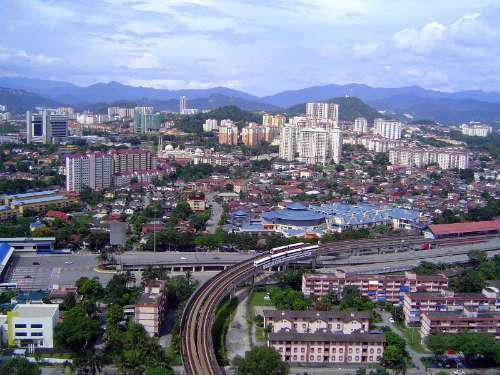 The view east from Ampang Park looks like an imaginary city in an advertisement paid for by a real-estate promoter. 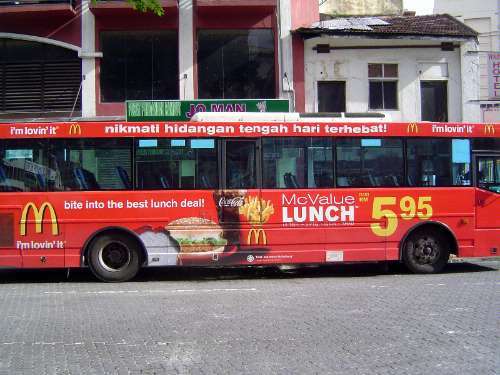 So is integration into the wider commercial world. 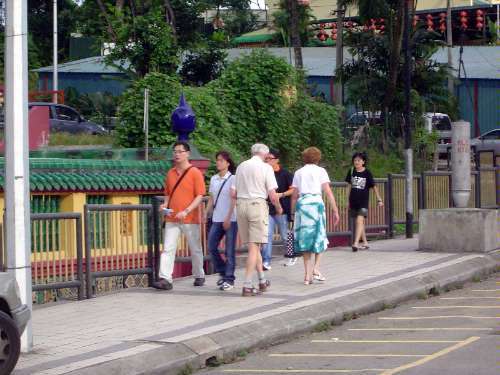 The old Chinese city has become a tourist Mecca. A Carrefour convenience store finds a Chinatown location. A facade is saved and awaits integration into a new building. Rehabilitation in progress at the corner of Lebuh Pasar Behar. Times have changed since Cuthbert Harrison, of the Malayan Civil Service, wrote the official Illustrated Guide to the Federated Malay States. The 1923 edition reports (pp. 89-91) that "the Chinese, who form the majority of the trading and shopkeeping population, prefer the rabbit warren to the garden city system of housing, [and so] they are easily accommodated on the flats near the river, whilst the European inhabitants occupy the white bungalows, each in its garden, which dot both the hills on the west and the rising ground on the east beyond the native town." 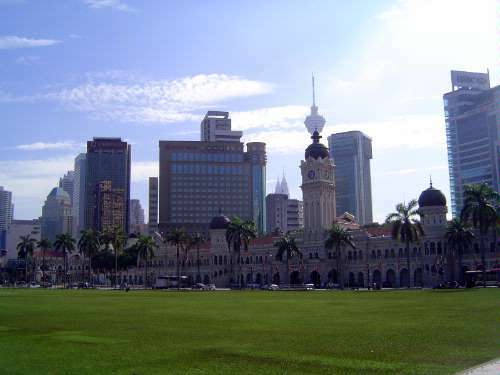 Harrison continues: Kuala Lumpur "does not require the European and the Asiatic to live side by side.... Tennis is played a good deal... the balls are retrieved by Tamil or Malay, or possibly Chinese children, who field for hours for a few cents to spend in cakes. But the climate is very hard on the rackets." Old shophouses on the Old Market Square, Lebuh Pasar, get some paint. 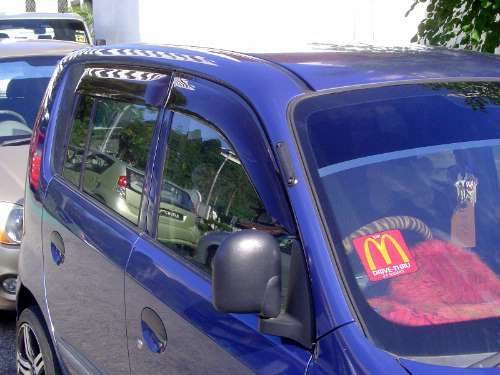 You won't miss this paint job. Be warned: you get what you pay for, including (in this case) some windowless rooms without any furniture except a mattress on the floor. AC costs extra. And the British? Yes, they're impeccably well-behaved but stand out a mile away.